Scottish poet Robert Burns didn’t compare his love to a red, red rose for nothing. Long associated with beauty and perfection, red roses are a time-honored way to say “I love you.” Whether it’s for a birthday, Valentine’s Day or just to express appreciation on any old day, there’s no better way than a bouquet of red roses to express your feelings. 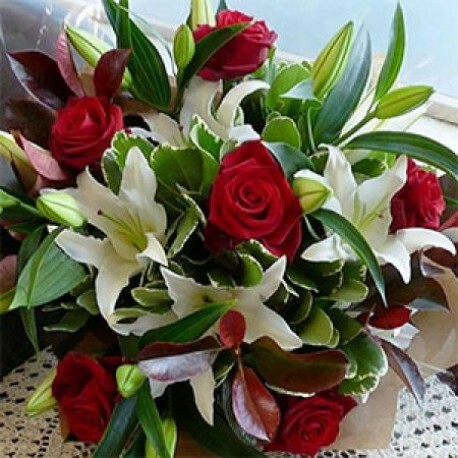 Adding the glorious oriental lily in to your rose bouquet will certainly give the scent of the exotic. The snowy white of the lily and the deep red of the Rose are matched wonderfully with glossy greens and fine grasses. This bouquet will certainly make the recipient smile. Our rose and lily hand tied come in an aqua pack ensuring freshness, gift boxed with a beautiful bow to match and a hand written card.